The rapid success of for-profit colleges and universities (FPCUs) only recently has caught the attention of scholars in academe. The continuing expansion of the proprietary higher education sector has lead to fundamental questions regarding the purpose and function of FPCUs. As new technologies continue to emerge, education is becoming of increasing import to employees seeking to upgrade their skills and employers in search of individuals who possess the necessary expertise and training to help their organizations succeed. For-profit institutions challenge traditional notions of the academy--such as shared governance, tenure, and academic freedom--by utilizing administrative practices that more aptly apply to the corporate arena. Moreover, they exclusively employ non-tenure-track faculty members. This study provides a framework for understanding faculty roles and responsibilities at for profit colleges and universities. The author employs a series of in-depth interviews with 53 faculty members, from four for-profit institutions. Utilizing a cultural framework, the study explores the attitudes, beliefs, and perceptions of faculty work with particular consideration given to faculty member's non-tenure-track status, participation in decision-making activities, and academic freedom. The study examines the culture of the faculty work by asking how the profit-seeking nature of the institution affects their efforts inside and outside of the classroom. 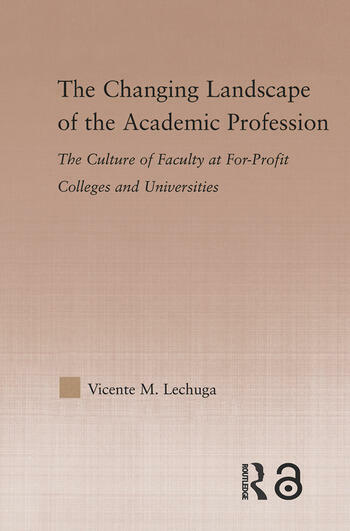 The author introduces a new component to the cultural framework that illustrates how the close ties between FPCUs and business and industry affect the nature of faculty work. Vicente M. Lechuga is a postdoctoral researcher in the Center for Higher Education Policy Analysis, at the University of Southern California. He is the co-editor of the recent New Directions for Higher Education issue entitled Restructuring Shared Governance in Higher Education. He received the 2004 Excellence in the Academy Award from the National Education Association for an article he co-authored, with William G. Tierney, on academic freedom. "Both researchers and teachers of faculty life will find the book useful."